We at Reading Soccer Fc believe in getting as many young people as possible involved in playing football,our emphersise is on fun,fair play and team work,giving children of all abilities a chance to enjoy and get the most out of football ! We pride ourselfs on being a friendly,family club encourageing parents to get involved at every opportunity ! 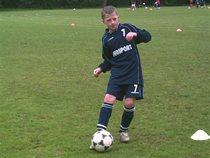 Or team of coaches have all been crb checked and coached at a high level at professinal clubs ensureing that you child will get the best quality coaching.